Awesome response, superior bendability and the sweetest tone ever. The Special 20 harp is the first choice for those learning to play. Its special airtight design makes it the most recommended go-to harp for harmonica players of any style, including blues, country, folk or rock. The plastic comb doesn’t absorb moisture making it longer lasting. Harp of choice of harmonica virtuoso John Popper (of Blues Traveler) and played by Bob Dylan on his 2007/08 tour. Chances are your favorite player has several of these harps in his case. Key of C Click Here! *To choose other available keys Click Here! plus a FREE HOHNER SOFT CASE! Get a $249.20 DISCOUNT on a 12-PACK OF SPECIAL 20’s (All 12 Major Keys!) Plus a FREE HOHNER HARD CASE! All Major Keys *Key of C recommended for beginners. How long does this special last? Would love to get one! I have a 6 year old grand daughter who loves to play around with a old Hohner blues harp that only plays on the draw and only a couple on the blow if that. It is pretty amazing the familiar sounds she is producing with that old harp. I was going to purchase one of the Hohner special 20 for her, as you recommend in this article above. 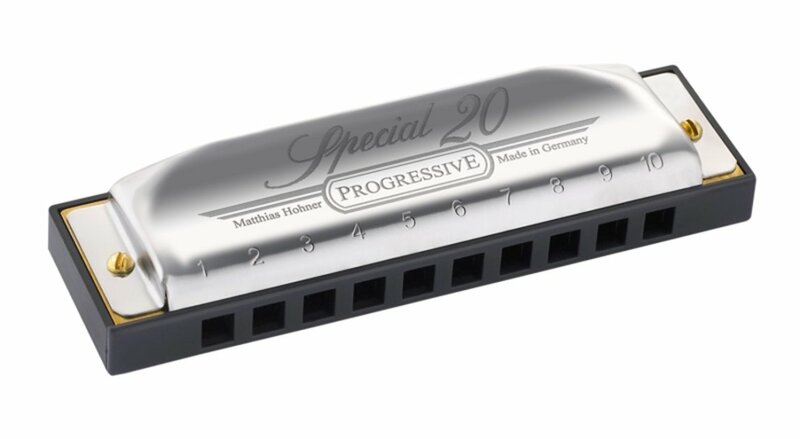 I was wondering if there is other models in the Hohner Brand or even other Manufactures and there models that would be easier for her to blow and draw other than the special 20? The reason I ask this is that she is just a small little gal and I am trying to get her the easiest to give her a little more volume range. Or maybe you don’t think that this is a concern that I should not be concerned with? Band was made with smaller ,square holes.They were about 2/3 the size of the ones made to day.I would think they would be a better fit for someone with a smaller mouth.Maybe they still make them? I was just curious about – does the hohner 20- have all the keys-(12), built into one unit- or are they all separated into separate units. It would be nice if someone built this type of harmonica?!! I have a D Hohner blues harp, Plus a Hohner A and C harp. I’m just learning and the C harp seems to feel the easiest for me to play. If I were to buy a Special 20, which would you recommend?? I was trying to decide which harmonica to purchase and the two I have been looking at are the Hohner Blue Midnight, and the Hohner Special 20 I am just starting to learn a little. I am also unsure which key would be the best to get. I just need one but I reside in Lagos, Nigeria. Hohner Special 20 Progressive Key Of C. This says progressive. I was looking for your songs and harmonica tabs ?? Hi JP. I know the outer shell of the special 20 is metal but is the core plastic? I heard that plastic is easier on the lips compared to the wooden ones. I own a hohner blues harp and the core is wood. I’m thinking of changing.